These are just a few of the comments that have been made about George A. Romero’s Dawn of the Dead. With the kind of fan following that this film has had for decades since its 1978 release, my expectations were admittedly high when I finally got around to watching it. At the risk of being tarred and feathered by die-hard Romero fans, I’m sorry to admit that I am more than a little disappointed in what is supposed to be the crowning jewel of Romero’s work. While most of the praise about this film is related to it’s underlying social commentary (i.e. the dangers of consumerism and the greed of the American masses) I just don’t see how the “moral of the story” can be taken all that seriously in a film that spends most of its time blowing up balloons full of food coloring and cane sugar syrup. The dated look and cheesy feel of Dawn of the Dead are not the only things that take away from what I’m sure Romero hoped to achieve. When it comes to the heart of the film, the general premise is brilliant, but the innovation pretty much stops there. The characters are unestablished in their traits and completely out-of-sync with one another. One of the main characters Roger is presented for the first half of the film as a relatively down-to-earth guy who is doing what he can to survive. Later in the film when he joins Peter to block off the entrances to the mall with cargo trucks, he inexplicably turns into the rowdy, reckless, risk-taking cowboy that shoots first and asks questions later. Most of the character performances are limited in this way–it’s hard to feel sympathy or get attached to a character when you don’t know who they really are or what they represent. This kind of chaotic character development may have been intentional, and if it was, I didn’t feel that it helped to make Romero’s world more disturbing or scary, just confusing and dull. For a film that had such high ambitions, a lot more time should have been spent on believable lines of character development, a more cohesive plot line, and better acting. It shouldn’t be so obvious in a horror film that your extras have no idea what they’re doing. The effects, makeup, and movement of the undead didn’t make me believe for a minute that they could have been capable of outsmarting or overrunning the living. The film didn’t seem all that gory to me until, for a minute or so about an hour and a half into the film, we’re made to watch the undead devour intestines and rip apart bodies of the living. This scene mostly said to me, “Oh yeah, we’re making a horror film about zombies eating people. So let’s gore it up for a couple minutes!” When it comes to this genre, I’m never too attracted to the concept of “gore for gore’s sake.” When the plot slows down in this film, it turns to such methods and in doing so, overcompensates for what it lacks in substance. While the film made an honest effort to be both humorous and morbid in its delivery of its political message, I found virtually every aspect of this film to not be nearly scary or funny enough for me to take the message seriously–in a word, BORING. Another moment in the film that had me scratching my head in amazement was the unexpected entry of the Hells’ Angels tank gang in the last twenty or so minutes. What these scenes said to me was, “We need to establish that there are other “bad” human survivors out there that haven’t learned their lesson… And we only have twenty minutes left, so hurry it up!” *followed by ten minutes of gunfire, shattering glass, and mouthfuls of flesh* I’ve read that Romero originally intended for the film to end with the male and female leads dying. I think that this would’ve actually been a better ending for the film, and the message might have gotten through to me a bit more easily if no one had survived. The fact that the two end up flying off into the sunset together seems too good to be true for a Romero film. All of this being said, the film is not a total washout. If I were to name a few things that I liked about it, they would definitely include the segment in which the surviving characters go on a consumer-binge in the zombie-free mall and pose for security camera photos as they take huge wads of cash out of store registers, the moment of Roger’s transformation (one of the only truly disturbing moments of the film), and Peter’s hilarious punch and kick-out near the end of the film (accompanied by a wonderfully Rocky-esque soundtrack). I’m not saying that it was a horrible movie, I just wished I would’ve been more shocked, more awed, and that it had lived up to the hype. 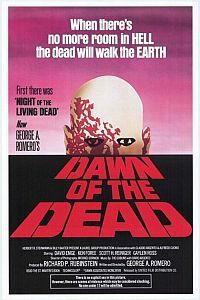 I might have been willing to make more excuses for this film because of its date of release, except for the fact that Romero’s infinitely better film Night of the Living Dead was released ten years earlier. In terms of a political statement or a revolutionary attempt at social commentary in the horror genre, I would look to Night of the Living Dead as a far greater representation of Romero at his best. since the “message” for the original night of the living dead was not intentional, maybe it’s best for zombie movies to have no intentional messages at all.